This is one of my favorite cakes to bake! It’s crazy delicious and super easy to throw together. 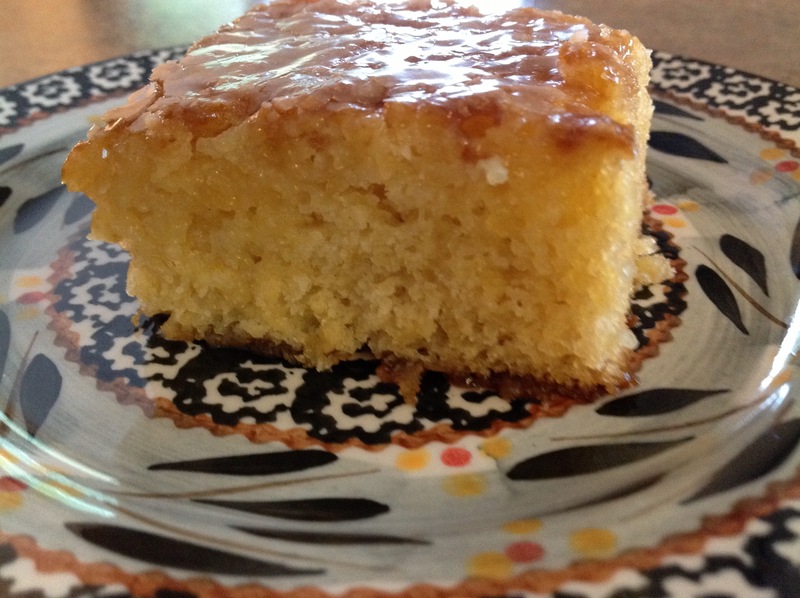 The taste reminds me of a Kentucky Butter Cake recipe I used to make when my children were little. The first time I made this cake, I was delighted to learn that there is no butter, shortening, or oil in this recipe. During the school year, I omit the glaze, and pop it into lunch boxes for a tasty lunchtime treat…Yum! Preheat oven to 350 degrees. Grease a 13×9″ baking pan. In a large bowl, mix together the flour, sugar and baking soda. Add eggs, vanilla, almond extract and crushed pineapple, with liquid. Mix well to combine. Bake 30-35 minutes, or until a toothpick inserted into cake comes out clean. On warm cake, frost with my Powdered Sugar Glaze. great blog! can’t wait to try some of your recipes! Thanks so much, Sarah…I look forward to having you stop by. Just checked out your sweater bag and I have to try to make one. You did a great job!